The weather for the last week or two has not been good around here - windy, wet (sometimes very much so) and a bit chilly for the time of year. Somebody a little upwind with vastly more experience of the weather around here agrees. If I was superstitious I'd think it was because I started on that solar warm air panel which it's made a) difficult to get so enthusiastic about and b) difficult to hold in place and keep dry long enough to do anything useful. Also, I hoped for a bit of rain to test that ditch - be careful what you wish for. My neighbours kindly offered me the use of their garage to finish the panel off but actually on Saturday I reorganised the stuff in the shed here to make some room and yesterday (Monday) I got the slots cut (rather messily) in the top and bottom and applied some stain but then the wind was driving the rain in through the door so I decided a better use for the evening would be to go to Thurso for some shopping. Given that it's an 80 mile round trip I don't do this often - usually it's just short of a month between visits. Just as I finished in Tesco with the fruit and veg the power went out. They wouldn't let us continue shopping even though the emergency lights were just about adequate so I hung around as long as I could hoping the power would come back then checked out with what I had. Power was out at Lidl as well so, having come that far, I decided it was worth adding another 20 miles each way to go on to Wick. I got a bit of a sinking feeling though, when, just past Watten, I saw that the large turbines to the south were stopped. The Radio 4 news then reported that power was out in Inverness and areas to the north. Wick was dark, traffic lights out, etc, but Tesco was well lit up and looked busy but when I went to the door they were actually shut. I don't know but I'd guess a branch like that is large enough to have generators rather than just a UPS for the tills but maybe there comes a point when they need to give the refrigeration priority or something. Or maybe they just don't like to operate when they've already lost their backup and don't want to risk a second level of failure. What was irritating, though, was that their poxy little greenwash wind turbines on the roof were just cogging round very slowly in the gusts. Obviously, with the grid off there was nowhere for them to send their power so they were braked as far as possible. It's a great pity that they seem not to be connected on the "downstream" side of the store UPS/generators where they'd actually do some good - at least extending the available run time in the case of a power cut. After all, the most likely time for a power cut is when it's very windy. It might be fun to ask them about this and see what percentage of the store's actual power consumption the turbines can really produce. WAG: 10%? 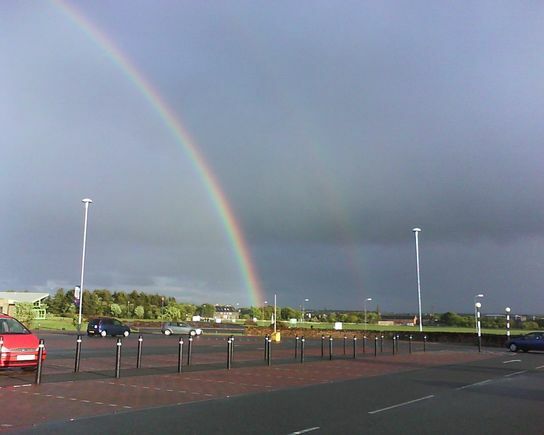 Still, at least there was a nice double rainbow to look at. 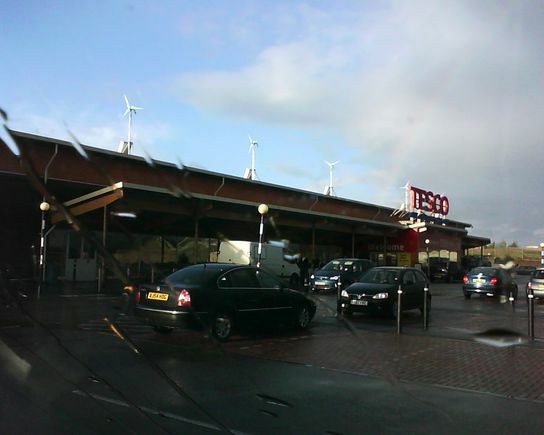 I then returned home via Thurso by which time the power was back on but something had tripped at Tesco so they now didn't have power for the tills. I asked it if was that the UPS wouldn't come on line until its batteries were charged or what the problem was but the woman didn't seem to even understand the question. As you might have noticed, I'm a big fan of small-scale power generation. One of the reasons for this is that it can give more local resilience to national-scale problems but the current split between grid-tied systems which only operate when the grid is available to feed into and off-grid systems which use significant resources storing energy in batteries is far from optimal. Maybe there needs to be a gradual rethink of the way the grid operates to make better use of local generation and allow islanding - that is, the operation of separate little mini-grids disconnected from the main grid. One of the objections presented to the use of renewable resources is the need for more cross-country grid lines which people say spoils the view. (I think this is a valid objection - the question is whether it is a worse problem than the continued use of fossil fuel power sources or the radical expansion of nuclear). Burying the cables would be an expensive solution. I can't help thinking, though, that the use of DC interconnects between regions (which are needed for underwater connections and I think are also useful/needed for underground) would help allowing safe islanding by not requiring different parts of the grid to be kept in phase. It would be interesting to know how far the turbines in the region could have kept Caithness operating yesterday evening. Even if they weren't sufficient for all of the possible power, use of a smart grid might well have been able to keep many services operating. A simple mechanism which limits houses to a few kilowatts each during difficult conditions might go a long way to improving resilience. The national grid is a magnificent achievement for 1950s technology but it's time to move on.